Former Prime Minister Manmohan Singh on Saturday said it was too early to conclude that the economic slowdown has reversed as the 6.3 per cent growth rate in the July-September quarter did not take into account the small and medium sector which suffered huge losses in the aftermath of demonetisation and hasty implementation of GST.He welcomed the 6.3 per cent growth rate in the July-September quarter but cautioned that it was too early to conclude that the economy has recovered. "(It) is too early to conclude that this represents a reversal of the declining trend observed in the previous five quarters. Some economists believe that the CSO which released the figures has not adequately captured the impact of demonetisation and GST on the informal sector that accounts for about 30 per cent of the economy," Singh said addressing professionals and businessmen here in the election-bound state. He quoted renowned economist Govinda Rao identifying a "problem" with the calculation of manufacturing growth based on corporate results. "This doesn't take into account the small and medium sector which suffered the most after demonetisation and the launch of GST. A couple of big worries remain. Farm sector growth fell to 1.7 per cent from 2.3 per cent in the previous quarter and 4.1 per cent in the same quarter last year," Singh said, citing Rao.He said that after farming, job losses have been the most in the construction sector. Singh criticised the BJP government's economic policies, particularly the "coercive steps" of note ban and the Goods and Services Tax (GST) that cost the nation hugely and "broke the back of businesses". "We saw the impact of demonetisation on the economy when the GDP growth dropped to 5.7 per cent in the first quarter of 2017-18 under the new calculations. Even this is bound to be a gross underestimate as the pain of the informal sector is not adequately captured in the GDP calculation. "Every one per cent loss of our GDP growth rate annually costs our nation Rs 1.5 lakh crore. Think of the human impact from the lost growth -- the lost jobs, the youth whose opportunities have vanished, the businesses who had to shut down and the entrepreneurs whose drive to succeed has turned into discouraged disappointment." Singh said that the decline in farming and construction sectors was despite the fact that the government had front loaded its spending on projects, "forcing up our fiscal deficit to a high of 96.1 per cent of the Rs 546,432 crore target set for the full year". "This means that private spending on construction has been very dismal... Thus there is still considerable uncertainty about the growth of GDP. The RBI forecasts that growth in 2017-19 will pick up to 6.7 per cent. However, even if growth reaches 6.7 per cent in 2017-18, Modiji's four year average growth rate will be only 7.1 per cent. 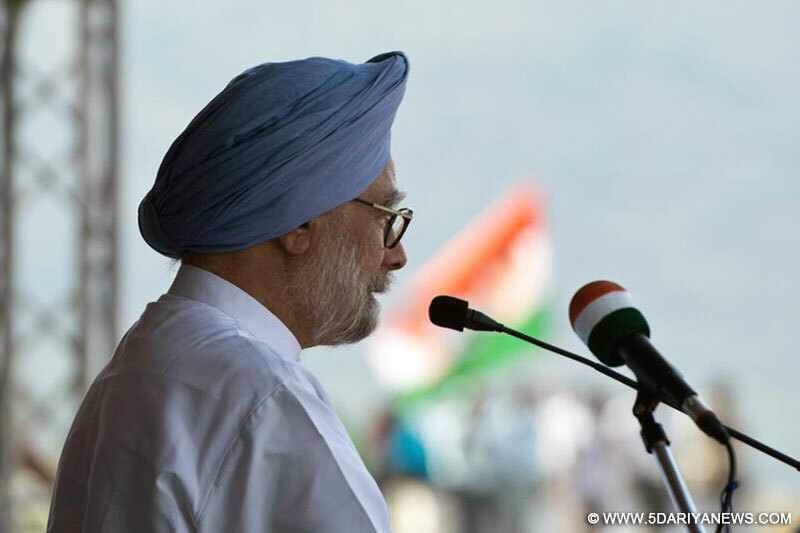 "To equal the UPA's 10 year average, the economy will have to grow at 10.6 per cent in the fifth year. I would be happy if this were to happen, but frankly I do not think it will. "The former Prime Minister said while Modi claimed to understand Gujarat and the poor "more than anybody else", how was it that "he never understood the pain his decisions unleashed".He hailed the people of Surat city, renowned world over for the diamond and the textile industries, and said it was one of the worst sufferers of note ban and GST. "It is no wonder that Surat voiced the biggest protests in India against this injustice by the NDA government. You after all come from the land of two great souls -- Mahatma Gandhi and Sardar Patel. When the Mahatma decided to protest against the unjust British tax on salt, he did it from your backyard in Dandi. Standing up for injustice is in your blood and you raised your voice against the shoddy implementation of GST," he said.